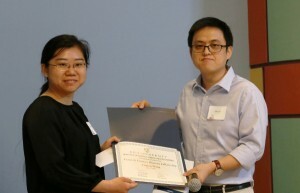 Luqing Wang, a third-year graduate student in Yakobson’s Group, has received the 2016 Franz and Frances Brotzen Fellowship Award from the MSNE Department. To honor Franz R. Brotzen, the Stanley C. Moore Professor Emeritus of Materials Science and a former dean of engineering, this fellowship was established by David Lee Davidson and his wife, Patricia, and to support an endowed fellowship for graduate students researching in the area of materials science. Luqing’s research focuses on predicting novel properties and understanding the cutting-edge mechanism of new two-dimensional materials based on first-principles calculations. She explores many-body and spin-orbit effects on the electronic structure of strained monolayer transition metal dichalcogenides, and the enhanced electro-mechanical anisotropy of phosphorene caused by the effects of uniaxial stress along an arbitrary direction. She also works on morphologies and phase transitions in tin sulfides, as well as routes for their controlled synthesis.